Linking up with Hallie today! So heavens to Betsy I don't pretend to be any kind of beauty expert. at all. in any way. And I feel totally out of my league posting anything like this, but I did very much enjoy making collages (see rookie evidence below), and I have come into my own nice little crunchy way of scrubbing up and deodorizing, so I figure I might as well share it since I'm trying to rock seven posts this week and this mama needs content. I wouldn't say these are my favorites exactly. There are plenty of fun spa-ish things I do, but I want to be true to my "regimen," and these are my only regulars. I haven't been using this exfoliating washcloth for long, but I love it. I like making exfoliating scrubs from oils and sugar/salt, but I don't always have the time to fuss with them and this is a quick natural way to ensure some good dead skin sloughing in a quick shower. Like most natural cloths, it's on the abrasive side...but that's why I like it, and it's allegedly not as abrasive as similar type cloths. It's mold resistant, and its loose weave ensures that it dries out fast which is really important to me. I'll use my skin brush when I want to exfoliate but I don't quite have time to shower...which is often. Dry skin brushing supposedly stimulates your lymphatic system and gets you good and detoxed...which is all well and good and whatever, but I like dry skin brushing because I like the way it feels and I like the way it makes my skin feel. Nothing like a good morning skin brush. My first foray into a natural beauty product was deodorant. I started trying natural deodorants in high school, so I feel like I've tried every brand under the sun and I was never totally happy with them. I did find one that I really liked, but a couple years later the company stopped making it. So when I saw a recipe for homemade deodorant in Soul Gardening, I jumped on that train fast and have loved loved loved it. This is the standard recipe running around the crunchosphere - I use a little more or a little less coconut oil depending on the time of year. You can read all kinds of variations on this recipe that honor different skin types at Crunch Betty or at Passionate Homemaking. If you've spent any time in the natural blogosphere you've almost certainly come across the anti-shampoo craze affectionately known as "No Poo." But I kind of hate the term "No Poo," so we'll go ahead and ban it on this here blog. 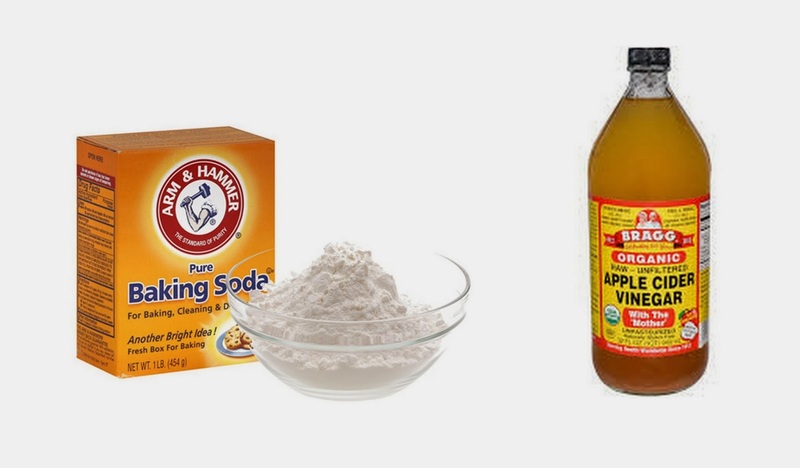 This hair cleansing method involves using baking soda dissolved in water to clean your hair and then diluted vinegar to condition your hair. I'll use shampoo every couple of months, but this is my go to hair cleansing method and has been for going on three years. If you're an overshampooer when you start this regimen it may take awhile for your hair to adjust and stop producing so much oil. I dissolve about a tablespoon of baking soda in a cup of water and a tablespoon of apple cider vinegar in a different cup of water and then pour my concoctions into good ole fashioned... ahem...peri bottles. I squirt the baking soda water all over my head scrub. Rinse. Then I do the same with the vinegar. Some people I know don't use the vinegar on their scalps, but that's what works for me. You can't skip the vinegar altogether because it throws off your hair's pH balance. The vinegar neutralizes the baking soda; you'll remember from all the volcanos in fifth grade. It was hard to choose a #5. I considered posting about my preferred dry shampoo (straight cornstarch), facewash (straight honey), toner (diluted apple cider vinegar), moisturizer (coconut oil), or my make-up remover (coconut oil again) but I don't use any of those regularly so they didn't seem very regimen-ish. The only other regular piece of my routine I could think of was just some sturdy castile soap because some jobs just need soap. So there you go. All kinds of basic. All kinds of boring. Lots of sloughing and not very antibacterial. Did I really just type that? Why why why am I posting this? I'm inches away from ditching the whole thing because I'm imagining you reading this and you're looking a lot like my composition students did back in the 8am day when I was like "Misplaced modifiers are fun!" Oh well. It's done. 7 in 7 friends. And MAYBE you will be inspired to throw some of your crunchy beauty regimens my way which I would love because I. am. a. sucker for this kind of stuff. So come on in. The tubwater's warm. Has your pantry invaded your bathroom too? Spill it. Off to Hallie's for more favorites. Girl I was all over this post. Thanks to your suggestion a few months back I started using cornstarch for dry shampoo once my big ol bottle of baby powder ran out. I actually prefer the cornstarch. Booyah! 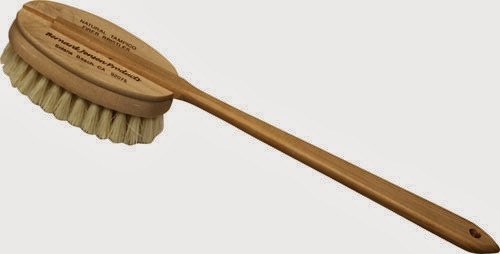 One of my roommates senior year had mentioned dry brushing and I was intrigued but now I think I need to hop on that bandwagon bc I don't shower half as often as I'd like (ie need) and to be able to exfoliate without showering sounds like a win win. Coconut oil is now a bathroom staple around here for basically all moisturizing needs. I once had a bottle of Dr Woods soap. It's very similar to the Bronners. I loved it for my face but I haven't bought any in a while bc I've been lazy/cheap and am just using my MIL's homemade soap for the face thing. I still love my Burt's Bees garden tomato face toner but it's probably not as economic as just gong diluted vinegar ... Aaah but it smells so so good. And I should really try a second attempt at the baking soda/vinegar wash/condition approach bc even though my hair is only washed 1-2x a week I had trouble embracing the non shampoo results. I should give it a go once my shampoo runs out. Anyway yay for all natural! And to be honest I was prob most drawn to the natural beauty regimine for $$ reasons. Cheap cheap cheap over here. Ok. This is way too long of a comment. That dry skin brush looks incredible. And maybe I'm just dreaming but I'm imagining that it would feel like a good scratch down of your bod. And that I can definitely go for. See, I read things like this, face palm, and think I am the epitome of "Life: You're doing it wrong." I hate all forms of store deodorant, and I should really just make my own, and I dislike the fragrances of many shampoos, so I should really just do your method too! Questions: How do you apply the deodorant you make? Does it become a paste that you rub on? How do you store it? Do you ever add essential oils to it for fragrance? I've never added essential oils, but I know plenty of people do with this recipe, like Chalayn below. I have mine in a jar in the bathroom, and I apply it with my finger tips. It's too warm here to store it in an old deodorant container without leaving it in the fridge and for as much bathroom/kitchen overlap as we've got going on I don't relish the idea of walking to the kitchen to apply deodorant. I love this list! 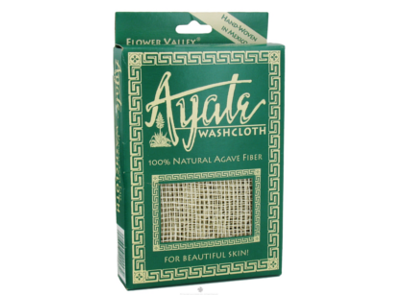 I actually do or have tried everything but the Ayate Washcloth. I want to try that now because I need a good exfoliater in the shower when I'm too lazy to use my sugar scrub. Oregano and orange! What a fun combo. I've never used them primarily because I never wanted to bother with it and I like the smell of coconut plenty. But essential oils would certainly make the deodorant seem snazzier! I make my own toothpaste with coconut oil, baking soda, xylitol and peppermint extract. Check out farmishmomma.com for the recipe. I love my homemade deodorant using Shea butter, coconut oil and baking soda; I just keep it in a jar on my bathroom counter and dip my fingers in for a small amount to rub in. 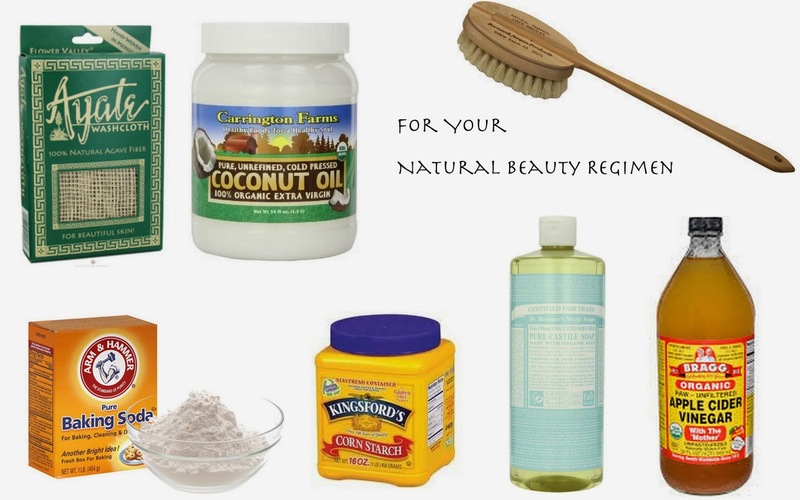 I've never made my own toothpaste (GASP) but I've done plenty of oil pulling with coconut oil. I've toyed with the idea of adding beeswax to my deodorant to harden it up a bit (because Texas) - how does Shea butter change the consistency? I haven't used beeswax, but Shea butter is fairly solid. Although, I should note that I live in North Dakota (aka arctic circle this winter), and as I've only been using it since this fall (aka winter temps for the rest of the country), I can't vouch for its solidifying nature in warmer weather. The Shea butter does seem to be a little grittier, but it rubs out just fine under my arms. I believe it's recommended to use an essential oil for scent, but I didn't have any and didn't feel like spending $25 on .75 oz for lavender. You could always add a little arrowroot starch to "stiffen it up". You really, really should try your own toothpaste; farmishmomma did some awesome research on the negative effects of commercial toothpaste and I am a total convert. It takes about a week to get used to but is so worth it! My husband uses it from time to time and always comments how much cleaner his mouth feels...but he doesn't want to waste the commercial toothpaste we still have. Soon. Lately, I've been exfoliating my face twice a week with just baking soda. About 1 tablespoon made into a paste with water. So far, I like it. I tried making my own deodorant and I LOVED IT...until it became more dry and it wrecked my pits for a good three months. I had the worst rash. If I ever get brave enough to try it again, I'm definitely going to add more coconut oil. I'm gonna try that washcloth. Thanks for the info. I've always wanted to try apple cider vinegar for my hair, I've heard that it makes it really shiny! And your so-called rookie collage looks great! What program did you use? You're so legit...I love this post. Ok so here's my question: how do you put the deodorant ON? Do you have it in a jar like face cream or lotion and just slather it on? Also--do you use coconut oil for eye makeup remover? Does it take all your mascara and/or eye liner off? And how do you do that...do you put it on a cotton ball and rub it on your eyes? Oh! Just saw you posted an answer to the deodorant question already. Is the consistency goopy? The consistency depends a lot on how warm it is and how much coconut oil you use. It's pretty runny in warm weather and downright hard in cold. And about the make-up remover: I just use my fingers to rub the oil all over my eyes and then you a kleenex or a piece of soft cloth to wipe it off. And I am inspired to try this stuff out! Kate, I also am loving this frequent posting! Curious - do you use honey as a facial cleanser daily? Orr are you one of these ladies with impossibly healthy skin (Kathleen!) that doesn't need daily attention? Right now I use an exfoliating glove + living clay soap but I'd jump on a homemade recommendation from you. I love a good crunchy beauty post! I *have* to use ACV at my parents' house in north Texas because I just get all sorts of gross buildup in it. I also use leftover beer if I don't finish a bottle the night before :) Coconut oil is incredible and I often use it to moisturize, but it hasn't become a permanent staple for me yet. I've never heard of that type of wash cloth before but it sounds neat! Oh I don’t find them boring at all! For me, taking care of your skin and wellness is never a tedious job. I even find it amazing that you are taking the time and effort to take care of yourself. Keep it up, and I would love to see if those beauty regimens yield wonderful result to your body. All of them look great! I believe being beautiful doesn’t have to be expensive, especially when you can find cheap, yet effective, alternatives. And I think drinking lots of water and getting enough sleep everyday also help on making your skin glow.